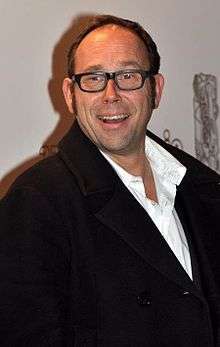 Olivier Gourmet (born 22 July 1963) is a Belgian actor. Gourmet was born in Namur. He won the Best Actor award at the 2002 Cannes Film Festival for his role in Le Fils by Jean-Pierre and Luc Dardenne. He also appeared in La Promesse, Rosetta and L'Enfant. ↑ "Olivier Gourmet". The New York Times. ↑ "Festival de Cannes: The Son". festival-cannes.com. Retrieved 2009-10-25. Wikimedia Commons has media related to Olivier Gourmet.